Here are a couple of wall hangings that are in my living room/sewing area. 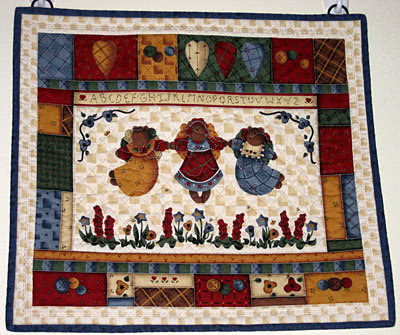 They are pre-printed fabric, which I quilted (not easy to see). In the centre of the panel, I did my first free motion meandering that wasn’t on a piece of scrap. It turned out fine, but I need lots of practice. These are so cute..especially the first one as I have such a fondness for sun flowers. Certainly enjoy your blog with all the hints, suggestions, etc. 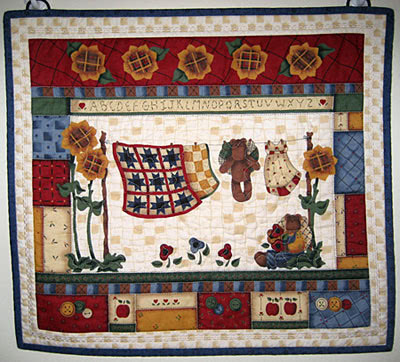 Hi, I used to have these panels, think I made baby quilts with them..
Just found you and see I’m listed. Thank you.